Pontiac Trans Am 455 H/O with four speed transmission and Hurst shifter. The air intake hood scoop is fully functional, the mileage is . 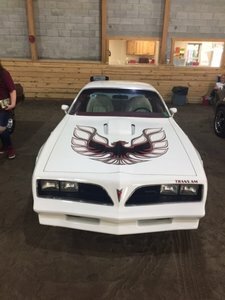 This T/A is equipped with power windows, brakes, steering w/a tilt wheel, A/C, AM/FM/8 track stereo. The car was repainted 10 years ago to its original color of Cameo White with a white interior. Car has been garage kept, and is rust free. Restored to original. Car runs great, rides exceptionally well. SERIOUS INQUIRIES ONLY! !